Combining the month's focus on Riesling styles with our occasional examinations of Eastern U.S. wines, we uncork a good Riesling from Kentucky, of all places. Nicely balanced and appealing and, as Rieslings do, works very well with a variety of food flavors. Combining the month's Wine Focus on Riesling styles with our occasional examinations of Eastern U.S. wines, let's uncork one of the more obscure wines I'm ever likely to feature here: A Riesling from Kentucky. This concept may not be as crazy as it first appears: If Kentucky is known for its limestone soil and water that produces great Bourbon, why shouldn't that terroir - not entirely different from some of Europe's best wine-growing areas - show well in Riesling, a grape variety particularly known for its expression of the earth in which it is grown? Of course, there's the small matter of vineyard age and experience: Germany's Rhine has been producing great wine since the Emperor Charlemagne was crowned there more than 1,200 years ago. In contrast, Kentucky's modern wine tradition goes back maybe 15 or 20 years, although it's gaining a bit of momentum as farmers seek value-added agricultural alternatives to tobacco. But these issues are typical of small-farm wineries in the Eastern U.S. The producer of today's Riesling, Lover's Leap Vineyard & Winery of Lawrenceburg, Ky., between Louisville and Frankfort, the state capital, boasts a few years of wine-making time. Jerry and Ann Holder have been growing grapes on their 24-acre property on a high bluff above the Kentucky River since 1994, and began producing wine there commercially early in the 2000s. 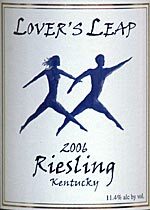 While I don't find a lot of limestone minerality in today's featured wine, Lover's Leap 2006 Kentucky Riesling, there is plenty of Riesling varietal character, with a ripe peach aroma and a back note of spearmint leading into a rather full texture. A touch of fresh-fruit sweetness is nicely balanced by tart acidity, and it finishes quite dry. My tasting notes are below. Like many Eastern wines from small producers, Lover's Leap wines are not available in interstate commerce. You can buy them at the winery and select Kentucky retail shops. As always when I write about small-farm Eastern wines, my advice is simple: Get out in your own part of the world and support your local wineries. Chances are you'll find someone making an attractive Riesling nearby. FOOD MATCH: A natural match with Chinese vegetarian fare (pan-fried tofu with spinach and stir-fried eggplant and garlic) from a local restaurant. VALUE: Even from an unfamiliar wine region, a quality Riesling for just over $10 makes a pretty good deal. WHEN TO DRINK: Ready to drink but should hold up for a year or two. Here's a list of wines on the winery Website, which also includes information about the winery, its owners and wine maker and more. Because of its limited regional production, Lover's Leap Riesling and other Lover's Leap wines are only available at the winery and select Kentucky wine shops. As always when I feature local wineries, I encourage you to visit a small-farm winery in your own part of the world and support your local wine maker.